Hhmmm…. the top part, the shirt like part should be a dark brown, and the dress/skirt and sleeves part should be a red. And the bottoms of the dress and sleeves could be a goldish color. And the crown could be gold and green, and the little “camisole” should be red, and the little lines/embellishments around the bottom of the shirt like part, should be gold too. Would that look good? I don’t think that it is too bold at all! 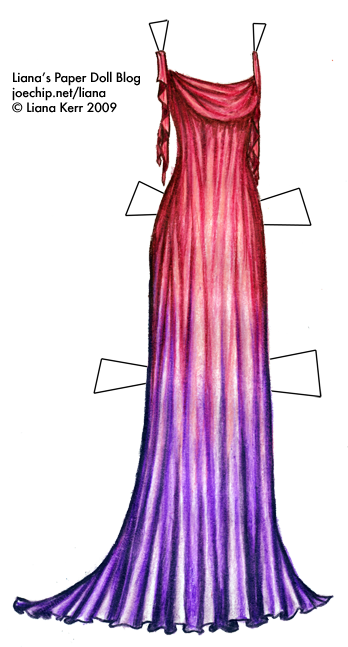 If elvish clothing is inspired by nature, then this is a sunset dress! Bright colors or not, I love this dress! At first glance I nearly said “wow” literally out loud. This is absolutely gorgeous! i love this dress! It is so pretty and i agree with em. This is a perfect sunset dress, and sunsets are a beautiful part of nature. It is absolutly gorgeous. And by the way, I just want to say yay the masquerade dresses might be next week, i love masks!